Dot got adopted by a family with kids who are going to love her up a whole bunch! I am 4 years old, and I am a tiny bundle of joy. I have a pretty black coat and tiny ears. Everything about me is cute and tiny (I'm a Netherland Dwarf! ), which makes my eyes look adorably bug-eyed. My cutest feature is my little white-colored nose. I easily fall in love with people and I love to follow them when we are playing outside. 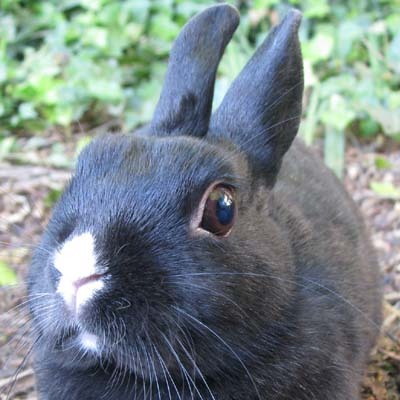 I am an all-around fantastic bunny just waiting for you to visit and fall in love with me. Also, I am currently living with my Guinea pig friend named Spot. He is great, and it would be wonderful if you considered giving him a home, too! Be sure to check out my other photos and my video on my Petfinder page!